Inglenook has a legendary status among wine lovers and professionals in the United States. Vintages from the 1940s and 1950s are often cited as among the greatest wines that many American wine professionals have ever tasted from California. 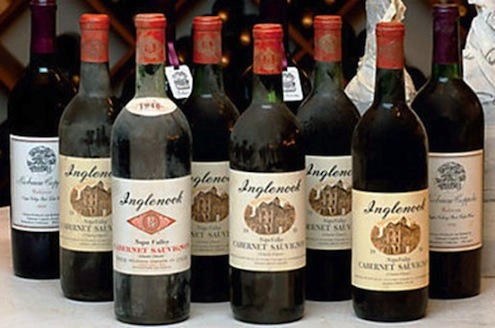 It is the Inglenook 1941, 1952, 1958 or 1959, which seem to have altered many people’s view of the potential and quality of Californian wines even before the controversial 1976 Paris tasting. Even their less highly regarded vintages from the 1960s left a deep impression on me, with their purity, depth, elegance and longevity. However, no one talks about Inglenook’s wines from the 1970s and 1980s. Sadly, this wonderful historic property went from superstar status to commercial wine when it was sold to large wine and spirits companies starting from 1964. Inglenook was founded in 1879 by Gustave Niebaum, a wealthy Finnish fur trader. Pre-1920s, Inglenook flourished and established a reputation for high quality wines. Niebaum’s vision was to make the finest wines comparable to the best in the world and according to articles referring to the wines and winery from the 1890s, the winery was successful. All this came to a halt during Prohibition, a bleak time for wine since all alcohol production and sales were banned from 1920 to 1933. After Prohibition, Inglenook was passed down to John Daniel Jr, the great-nephew of Niebaum. He dedicated himself to making magnificent wines at Inglenook with winemaker George Deuer and the cask series produced during this period are legendary. While Daniel Jr had the knack for producing great wines, his business acumen was less astute and the property was sold in 1964 to Louis Petri, founder of a large wine corporation and United Vintners. It was sold again five years later to spirits conglomerate Heublein and Inglenook lost its reputation as a pioneer of fine wines. Instead, it became a mass market wine trading on its historic name rather than on quality. The new era of Inglenook begins in 1975: Enter filmmaker Francis Ford Coppola. He purchased 1,560 acres of the former Inglenook property, which included the historic Victorian mansion built by Niebaum. Coppola launched his own wine in 1977 and christened it Niebaum-Coppola with Rubicon as their icon wine. It took nearly four decades for Coppola to consolidate the vineyards formerly owned by Niebaum and his nephew Daniel Jr – in 1995 Coppola bought the old Inglenook winery and the remaining Inglenook vineyard. One small former Inglenook parcel that still does not belong to Coppola is currently owned by Christian Moueix of Chateau Petrus and the wines from that vineyard is called Dominus. In April 2012, Coppola finally realized his dream of reuniting the property and restoring the name – he managed to buy the Inglenook trademark and rights to use the name from the Wine Group. In February 2013, I visited Napa Valley and spent time with their new Estate Manager and winemaker, Philippe Bascaules, the former winemaker of Bordeaux’ first growth property, Chateau Margaux. Bascaules admitted it took time to become accustomed to the vineyard’s different growing conditions compared to Bordeaux, such as the higher temperatures and the strong sun. He adds, “My work in the vineyard now is about protecting the vines from the sun and the heat.” But he has wasted little time conducting experiments in the vineyard to achieve full ripeness at lower sugar levels. January 2011 was Bascaules’ first time in San Francisco and in Napa Valley. After his preliminary three-day visit, he says, “I was very excited and surprised by the beauty of the place and the will of Francis Coppola. I tasted some older vintages of Inglenook and spent time on the property and I could see the potential [to make great wine] was high.” He resigned from Chateau Margaux, packed his bags and arrived in Napa just in time for the 2011 harvest. Tasting the 2011 wines, which was a challenging, cool year in California, there is no doubt that nothing short of a revolution in wine style is occurring at Inglenook. The 2011s, both the Rubicon and the white wine Blancaneaux, are intensely aromatic and elegant reminiscent of Chateau Margaux’ grand vin and their Pavillon Blanc. Rubicon has distinctive aroma of violets, roses and there is a lightness and elegance that seems to be both a reflection of Bascaules’ 20 years of experience with Chateau Margaux as well as the vintage which was generally light across Napa Valley. The 2012 barrel samples I tasted were profound and elegant. This will be an amazing vintage, the one where Bascaules tweaks and improvements in the winery and vineyard will start to surface – the use of smaller picking bins, less irrigation, the upgrade to a better press and picking at lower sugar levels – all without losing complexity and the identity of the vineyard. Bascaules sums up his goal for Inglenook: “I am more interested in consistency, density, tannin quality and balance, but not concentration. My goal is to make wines that are built to last.” From the wines I tasted at Inglenook, it appears he is well on his way to achieving his goals.